Today we can buy a handful of spinning reels that are capable of landing fish in excess of 200kg, but that has been the case for only a short amount of time in the extended history of fishing tackle. Spinning reels have historically been deemed unfit to catch big saltwater fish, and although large sized spinners have always existed, they were merely about line capacity and casting distance, not catching large pelagic predators. For big tasks people used conventional reels, and it was pretty unthinkable that you'd go even after a 50kg fish using a spinning reel. This review is of the reel that led the charge to change the rules, a reel that I consider to be the legitimate Godfather of big-game spinning reels; DAM Quick 5001. To know a bit about the company and the origins of the reel we need to go back to the golden age of fishing tackle. 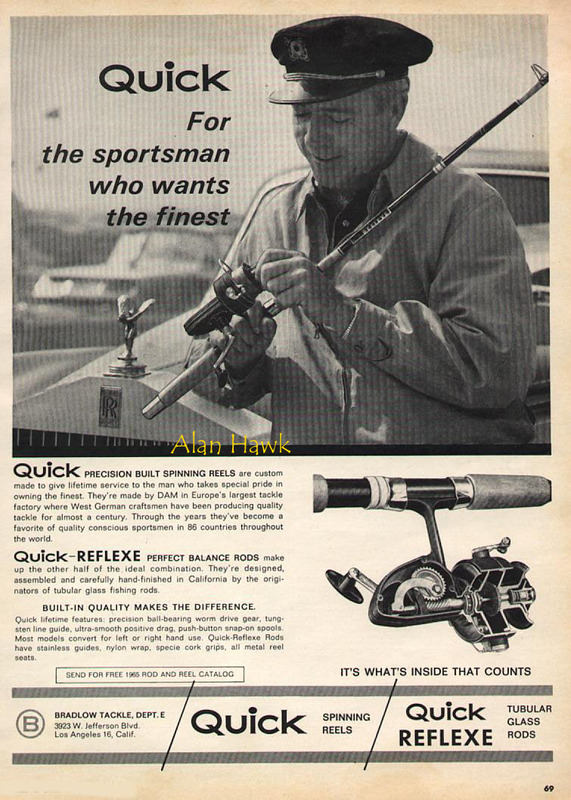 The 1960s and 1970s were golden because prior to that time metallurgy and manufacturing technology still had their limitations and couldn't offer much to a spinning reel in a cost effective manner, and following those two decades came the darkest times for fishing tackle where cheapness and disposability became the norm, bringing down almost all companies that made quality tackle. Some of those companies may still be in business today, but only in name. Those companies were bought by conglomerates who couldn't care less about heritage and quality, they handed production over to Chinese contractors, and today their products are generic garbage bearing legendary names. DAM (Deutsche Angelgeräte Manufaktur) is one of those companies. Once one of the greats, then in 1994 it lost its independence and went through several changes of ownership until it ended up with the current owner, Svendsen Sport of Denmark. I remember personally following those changes of ownership and each time the company would enthusiastically claim a rebirth and a return to greatness with a new owner, then the company would be taken over by someone else and goes on to describe the previous ownership as a "passing turbulent phase" or something to that effect. Models and reels' families would appear and disappear quickly leaving absolutely no mark, and I doubt that anyone remembers the Dura, Futura, Space, TTX, AT, VIA, Via Surf, Original, ATP, HPN, or the modern Finessa. The only notable reels they built after 1994 were the nostalgic FD in 2007, but it was good only for a very short time before they downgraded the gears and the overall quality of the reel fell dramatically as I'll explain in detail when I review it. Now they sank even lower with the introduction of the "Royal" which is a highly corrosive shelf reel from China that's sold under other brands as well, and in that DAM is emulating the many rubbish retailing companies that appeared all over Europe and other continents in the past few years. A very sad fate. Back in the golden times there were literally tens of companies making spinning reels spread across many countries such as France, UK, Italy, USA, West Germany, Switzerland, and even behind the Iron Curtain in East Germany, Hungary, Czechoslovakia, Poland, and the Soviet Union. One day I might make a combined review of the "communist spinning reels" if I may call them so. Of the large number of companies that made spinning reels back then, three stood out as the most popular whose reels could be found in every country in the world where people fish. Those three were Mitchell, Abu Garcia, and DAM. Penn was a world leader in big game conventional reels, but their spinning reels didn't have the same global penetration as the other three brands despite being very popular in the domestic US market. Comparing the big three I can say that in terms of design innovation DAM comes first, followed by Abu, then Mitchell in the third place. Quality of construction was a different story though with Abu taking the lead, followed by Mitchell, then DAM comfortably in the third place. DAM built smart durable reels, but to keep them affordable corners were cut here and there leading to higher percentage of fit and finish imperfections. Actually most of the reel companies prior to the 1980s built their premium spinning reels on that system, and many of them also offered "lesser quality" reels that had more basic gearing and these were built either in the original country of the brand or overseas in Japan, Hong Kong (now a part of China), or Korea to keep the cost low. The most notable exception is Mitchell which never used the worm gear system. DAM started building their premium reels on the worm gear beginning 1954 with the Quick Super 270, while cheaper reels were built with bevel or hypoid gears. Some notable lower grade reels were the 111-444 series (Hypoid, Germany), the 79-90 series (Bevel, Germany), and the SLS series (Hypoid, Japan). Of course back then Japan was considered a producer of cheap goods before that country gradually changed to become what it is today. In 1977 a new family of skirted spool spinning reels appeared, first in sizes 3000 & 4000, then in 1978 came the rest of the series 1000, 1400, 2000, and the big 5000. As innovative as these reels were, something was still missing, and sure enough less than two years later that family was discontinued and replaced with a new generation. That new generation that came in 1980 comprised 6 reels; 1001, 1401, 2001, 3001, 4001, and the reel reviewed today, the 5001. DAM has always been proud of the heritage of quality associated with the words "Made in West Germany", sometimes to the point of excess as you'll see later on. The packaging was pretty decent with flaps holding the reel down. DAM cared a lot about the presentation of their top reels, and the 1994 Quick Royal MDS lavishly housed in a carved wooden box stands out as having the most expensive packaging of a mass produced spinning reel ever. It was much nicer than the wooden box early ZeeBaas reels came in. The country of origin displayed very prominently on the box as well. The reel came with a manual (#1), an illustrated guide to changing the winding side (#2), a plastic bag containing a spare bail spring, washers, a spare rubber ring, and a lever for right side winding (#3), and finally a green "Reel Passport" (#4). 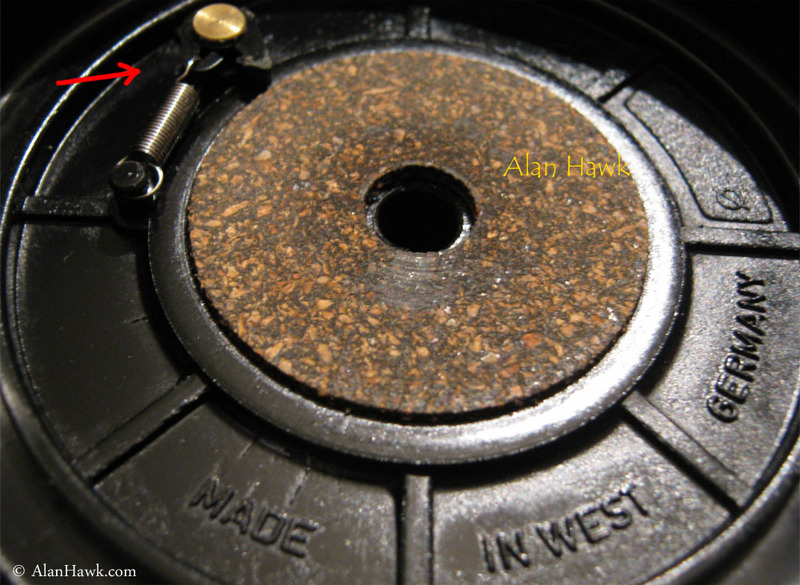 The red arrow points the final quality control sticker that was stuck on the reel's foot when it left the factory. As you can see on one side it says "Bundesrepublik Deutschland", translated right beneath it to "Federal Republic of Germany", then on the flip side it says "Made in Germany" on the left, and the stamp on the reel's picture on the right says "Made in West Germany". Told you they did it excessively! That cute reel passport had a list of the most prominent features and a lifetime guarantee against manufacturing defects. Before we move on I need to explain the different series that will be mentioned in this review to prevent confusion. The manual was a folded down massive piece of paper that had a treasure of information. In the photo above you can see parts diagrams for all the reels in the series as well as parts names and serial numbers. This was the last version of the manual by the way. Earlier reels in this series came first with a booklet type manual that had a black cover, then it became a similar folded paper but had a different design, then came this last version. 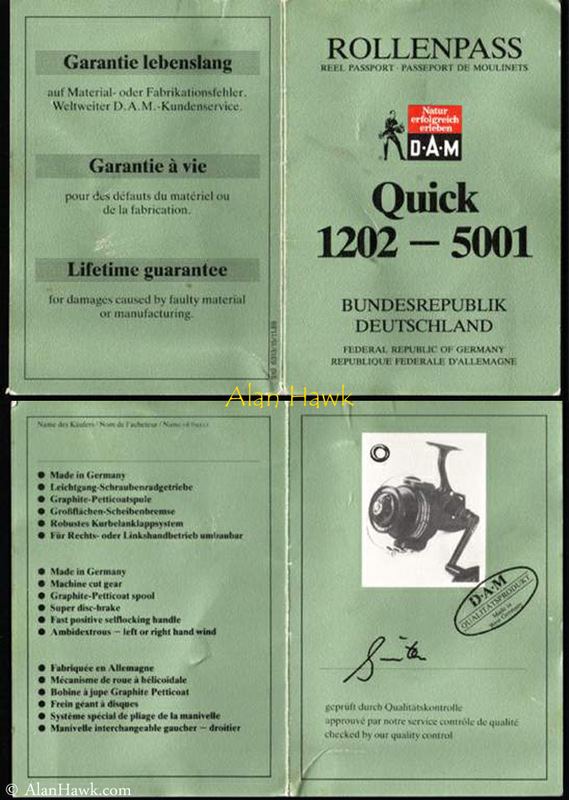 Reels bound for the US market had a booklet type manual but the cover was marked with the name and address of the American distributor "Quick Corporation of America". The other side of the manual had diagrams of different features of the reels. 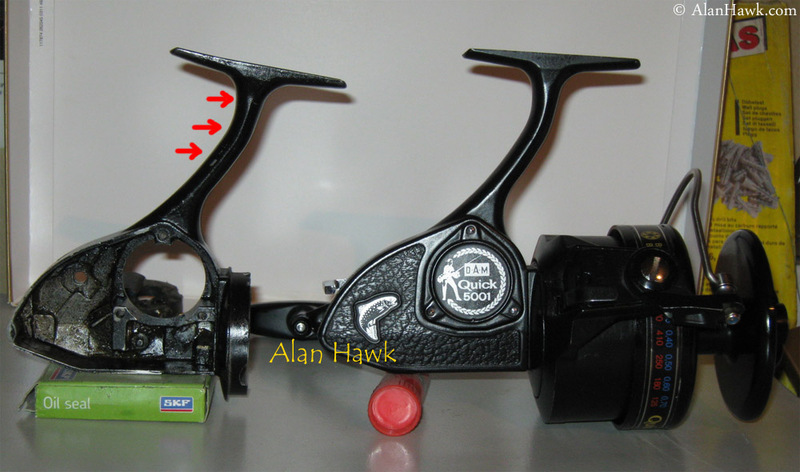 The red arrow points a diagram of the double skirted plastic spool of 1202, 2002, 3002 models. That double skirt was a new concept designed to keep line from getting behind the spool and wrapping around the shaft, which was a common problem back in the days of mono lines. 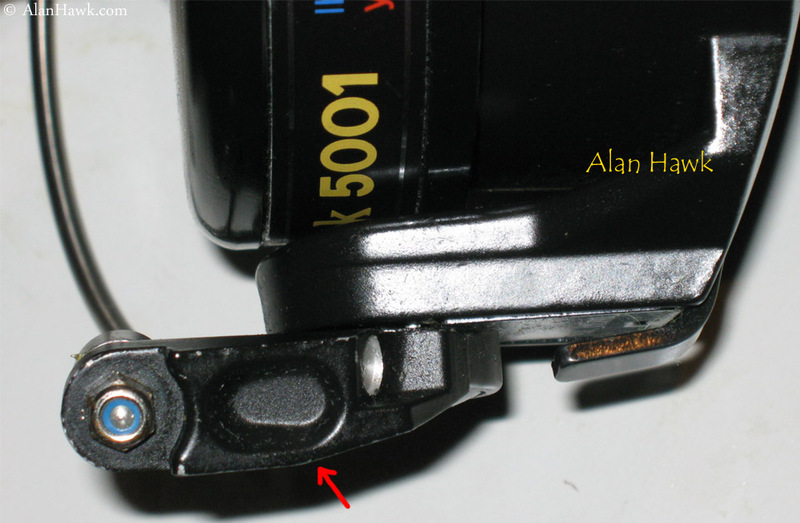 It did work but I was wary of those plastic spools because plastic spools on other DAM models, such as the 110-550 series, had the bad habit of cracking when the drag was tightened. Still in the above photo, the blue arrow points a mistake in the English text stating a "stainless steel" pinion. Actually the pinion was made of carbon steel, not stainless steel, and the German and French text correctly state this. When they figured out the mistake they started to manually strike off the word "stainless" using a black marker before the reels left the factory. Still on the manual, the specifications table had a clue that the 5001 was meant for serious work. They made a special version of it that had a very slow 1:2.5 ratio for maximum torque (red arrow). I have not seen one of those slow reels in person and I believe them to be quite rare. Saw a pair of the 1:2.5 gears for sale a few years ago which could be used to change the ratio of a regular 5001, but decided not to mess about. The reel reviewed here is the normal speed 1:4 version. The reel weighed 777 grams (27.4 oz) and the very deep spool took about 385 metres (420 yards) of 0.40mm (0.015 inch) thick line. The optimum drag design in a modern big game spinner such as Stella, TwinSpin, or Penn Torque is a twin drag design where the spool has braking washers on the top and the bottom. How about the Quick 5001? The best drag design that existed prior to this reel was a traditional top stack of small felt washers, but the Quick 5001 came with a unique setup of large washers on the top and bottom of the spool, just as found on quality reels today. The top drag of the Quick comprised an asbestos brake disc (#1), a large metal pressure disc (#2), and a separator washer (#3) to insulate the drag knob (#4) from the metal drag disc which would heat up in a long fight at high drag settings. The bottom drag consisted of a thick cork disc (#5) and a large clicker gear that double tasked as the spool hub as well (#6). The asbestos used to make the top drag is the best brake material ever used in a reel. I find it to be superior to the woven carbon discs used in modern reels. The asbestos is just as smooth, but has much better durability, heat resistance, and heat dissipation properties. 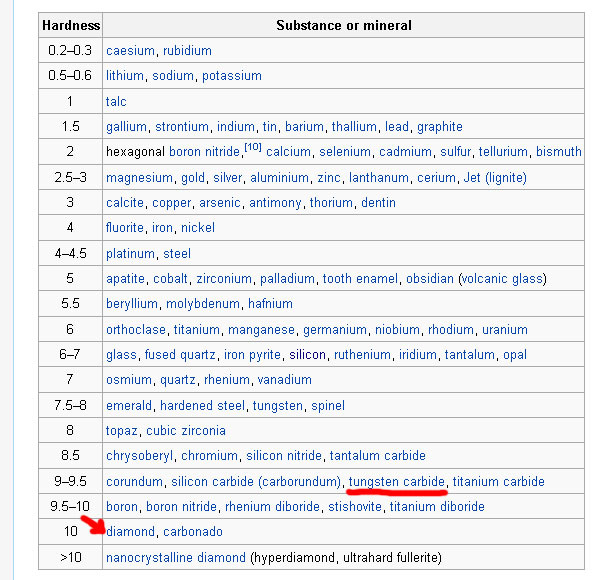 Asbestos was actually used to make car brakes because of those unique properties but since mid 1980s it was proven to cause lung cancer and was banned and phased out from existing applications. The Quick 5001 puts out a maximum usable drag force of 18kg (40lb) as I tested, which is way beyond any spinning reel that existed then, and actually is still very impressive by today's standards. Of course the dangers of asbestos weren't known then, so DAM just used the best braking material available to create the first ever serious big game drag on a spinning reel, a drag that is very comparable in structure and performance to the ones in high end reels today. The drag knob was spring loaded, a design that's now found in every modern reel. DAM understood the importance of a spring loaded knob in applying the drag force evenly and compensating for heat expansion in metal drag components. Still with the spool, here is a silly little feature. The band bearing the capacity information could spin to display the type of line on the spool in mm and lbs. If you load the spool with 0.40mm line for example you should rotate the band until "0.40" was visible through that little window, therefore you'd know what line is on if you forget or if you store the reel for a while. A close up on the cork drag washer at the bottom of the spool, and again they make sure we know where it's made in case we had forgotten! The drag clicker (red arrow) is a bullet proof design with a coil spring and a brass pin guaranteed to keep it going forever. 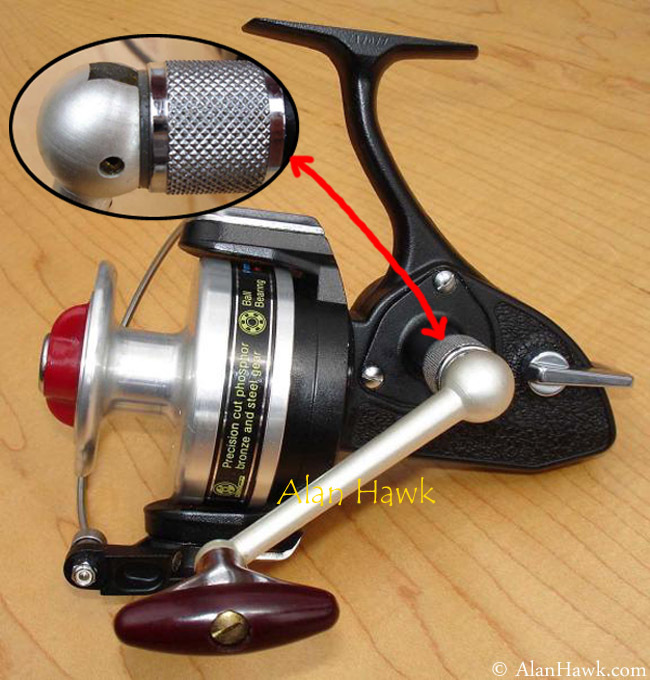 For comparison Mitchell reels usually had either a leaf metal or a plastic clicker that would bend out of shape or break leaving the reel silent. A closer look at the drag clicker tongue, and here we see an example of the finish issues mentioned earlier. The tongue is a little deformed at the tip (red arrow), and although it still clicks audibly it certainly looks ugly. If you look closely at the cross pin in the main shaft you'll see that it's not solid, but rather a rolled-pin. Rollpins are cheaper than solid pins, and a rollpin doesn't require tight manufacturing tolerance because once installed in a hole it unrolls itself and expands a little, filling the hole and becoming lodged without the need for fasteners. 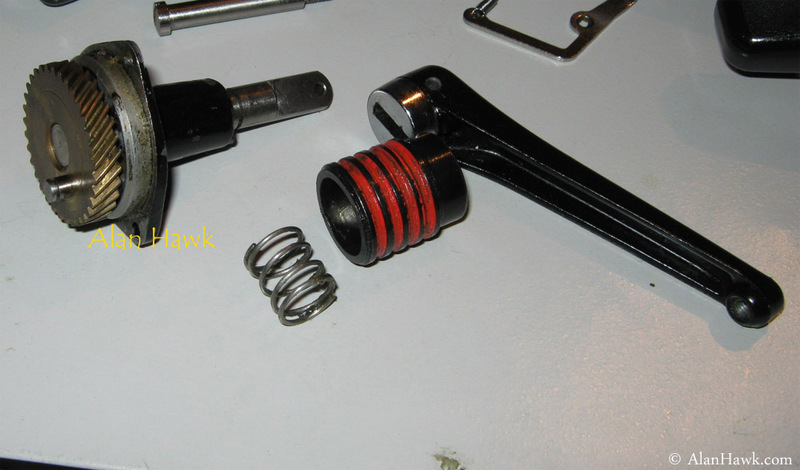 A great trick to keep costs down while making a perfectly functioning part. This way the user can change the height of the spool depending on the thickness of the line used to achieve optimum line lay. This eliminates the need to carry around a bag of spool shims. "Shimless shimming" sounds like a good name for that smart design! The second hub gear you see in the photo above belongs to another Quick 5001. Two reels are used in this review, one I used for many years and destroyed on big fish, and another one that I've had for about 5 years because I can't live without a functioning 5001. More innovation is seen here. Just beneath the spool there are three posts (red arrows), marked with L (low), M (medium), and H (high) on the silver plate. 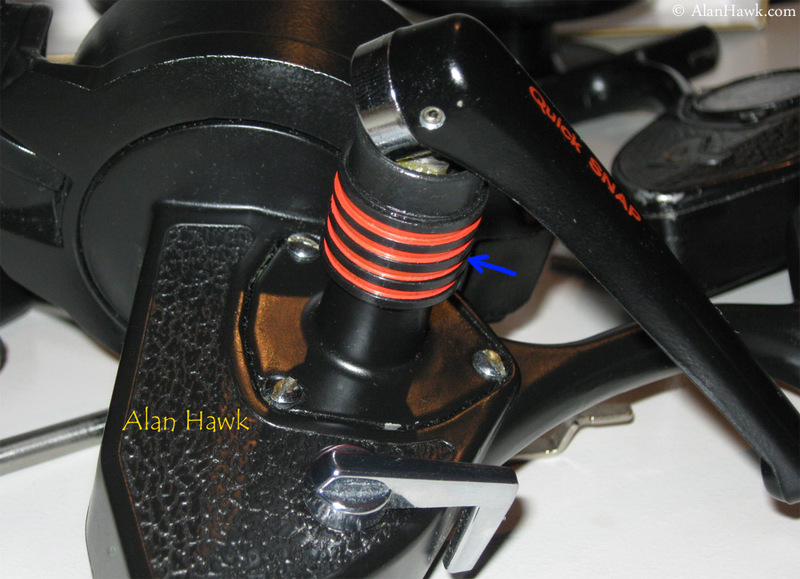 The reel has a rotor brake, which is an automatic brake that engages once the bail is open to keep the rotor still and prevent premature closures during casts. You could close the bail either manually, or turn the handle to trip it closed. 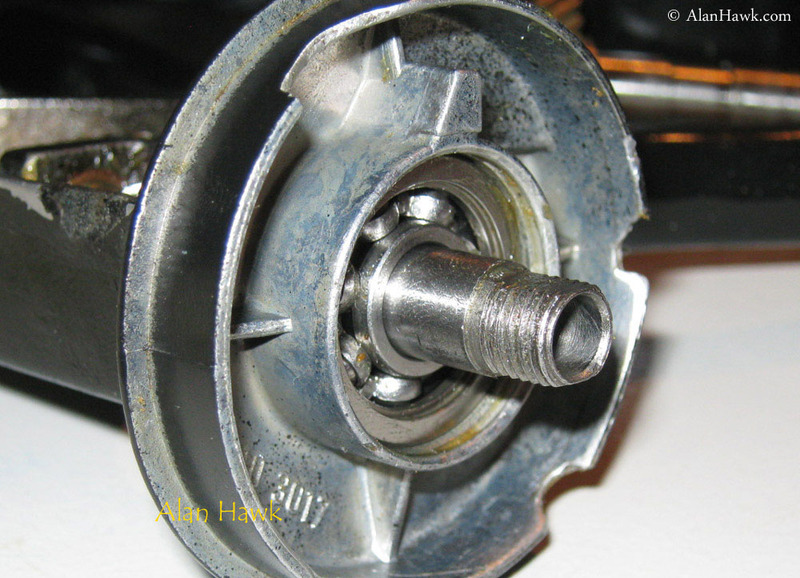 By choosing to connect the spring (blue arrow) to one of the posts, high, medium, or low, you control the power of that rotor brake. If you cast heavy rigs fiercely in the surf you'd prefer a more powerful brake, but if you're float fishing or throwing spoons to Pike in freshwater you'd probably opt for a lighter brake. Of course the stronger the brake is, the harder it is to trip the bail by turning the handle and vice versa. The white arrows point to where the silver plate engages two metal flaps to deliver movement to the rotor. Usually the pinion would be keyed to the base of the rotor or has a small keyed washer below the nut, but here the pinion is keyed to the large metal plate which engages the rotor via the two flaps. No advantage here, just a neat design. 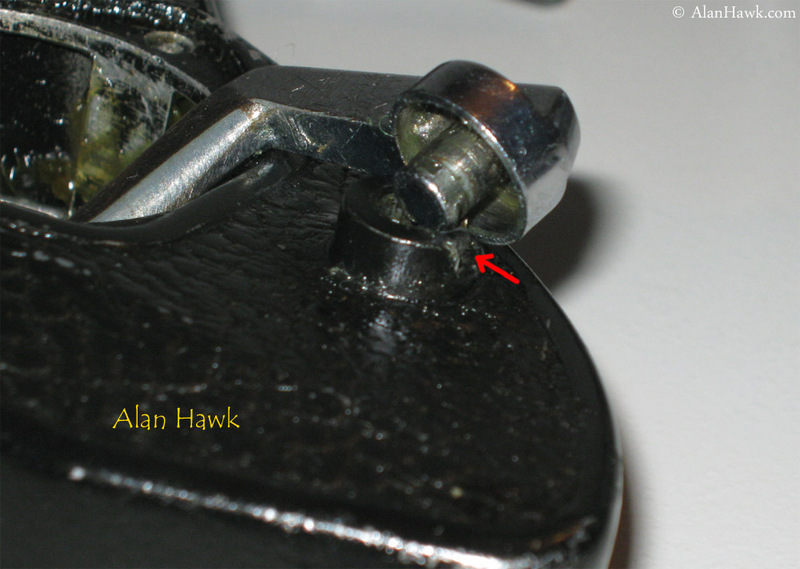 The green arrow in the above photo points a washer that's bent upwards to secure the nut and prevent it from getting loose. Again a low cost design that borders crudity, but it works reliably. Underneath the plate you can see the automatic bail trip lever (red arrow) and the part of it that extends out to push the bail arm closed (blue arrow). A rotor brake and an internal automatic bail trip were considered prestigious features in a skirted spool reel back then. 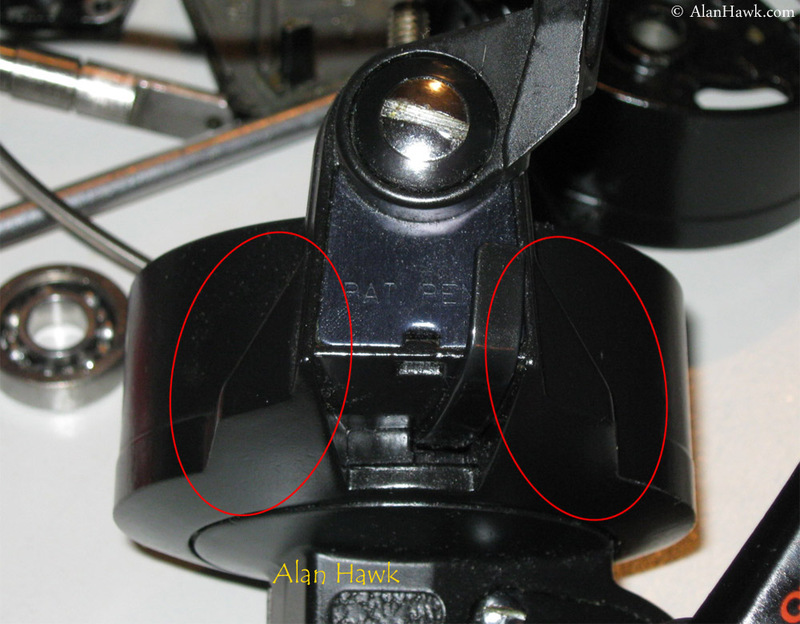 For comparison a later Penn 850SS or a Daiwa BG 90 had nothing to stop the rotor during casts and the bail tripped on both reels by hitting an external protrusion in the reel's stem. Still in the above photo, the green arrow points the aforementioned rotor brake lever. 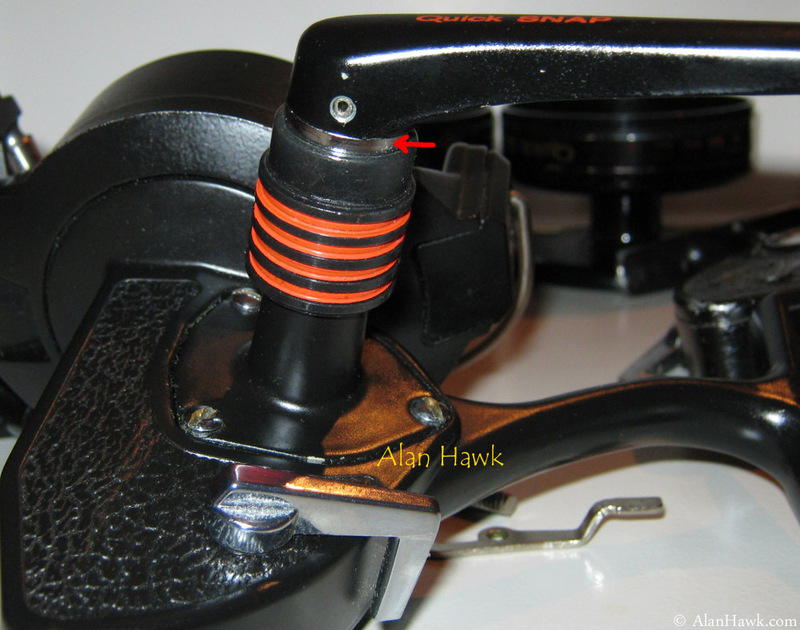 This is the other side of the rotor and the red arrow points the tip of the brake lever which engages the body of the reel to stop the rotor when the bail is opened. There is a rubber ring on it to create friction, and when that ring becomes worn it could be inverted so that the inner side of the ring that remained intact (red X) would come into action. When that other side becomes worn as well the entire ring should be replaced with the spare one that comes in the plastic bag, shown at the beginning of the review. 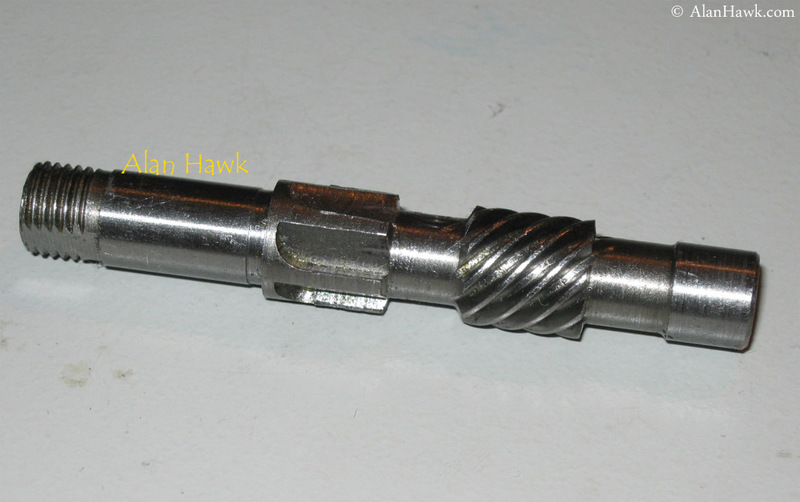 The pinion assembly is retained by one of the strongest locking systems known. 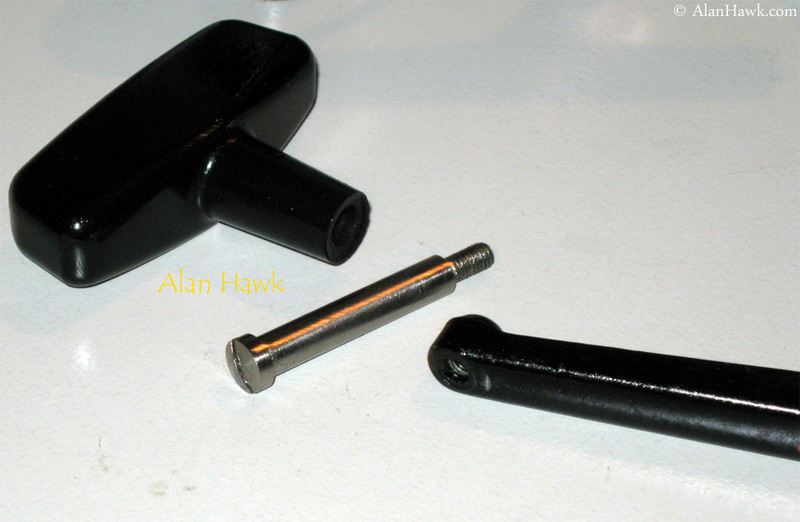 A steel snap ring (red arrow) that fits into a channel moulded into the body itself, resulting in a contact area that's much bigger than when a few screws are used to retain the assembly. The modern Penn Torque spinning reel uses this exact design, and the only way this could fail is if the housing itself shears. Need to mention that the broken bits in the flange (blue arrows) were intentionally broken by myself. After I killed this reel I broke bits off the body and sent them to someone to analyse and determine the alloy used in the body. Excessive curiosity! Underneath the snap ring there is a wavy washer. This washer is there to absorb severe shocks. Beneath the wavy washer there is a flat brass washer to protect the bearing from contamination. Then the huge ball bearing itself. 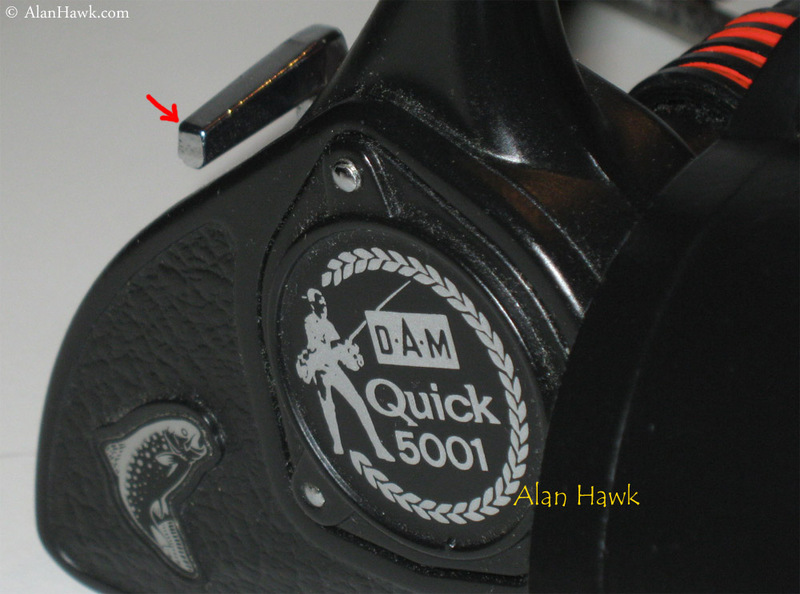 Like all classic reels, the Quick 5001 had only one ball bearing in the location that matters the most. This ball bearing was made in Germany and is of an outstanding quality. This is the epitome of old world reliability. Simplicity, no grey metal anywhere, and every part screams sheer strength. #1 is the drive gear, #2 is the pinion, #3 is the anti-reverse lever, #4 is the spring of the anti-reverse switch, and #5 is the oscillation lever with the snap ring retainer removed. This lever is made of solid brass and transfers the oscillation movement directly to the main shaft through stainless steel pins at both ends. No fuss, and nothing that would break or jam or wear out. Here it is. 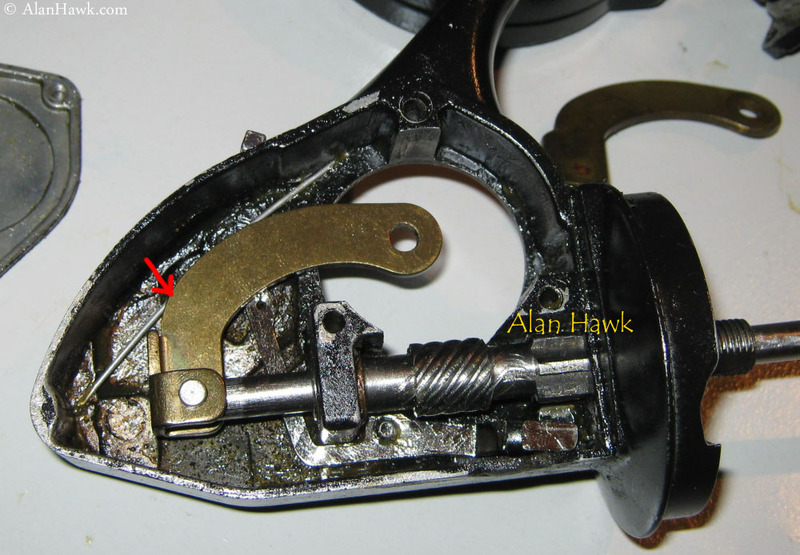 A stainless steel anti-reverse lever (red arrow) that worked directly on the pinion, similarly eliminating any stress on the teeth of the gears. In the photo above it's switched off, leaving the reel free to spin both ways. This is the anti-reverse switched on. The lever is now pulled back by the spring (red arrow), forcing the tip of the lever (red X) to go up and engage the secondary set of teeth on the pinion (blue arrow). When the handle is turned forward the lever's tip slips on the teeth without interrupting, but when the rotor tries to spin backwards that tip gets wedged between the teeth and the reel's body preventing the pinion from turning. 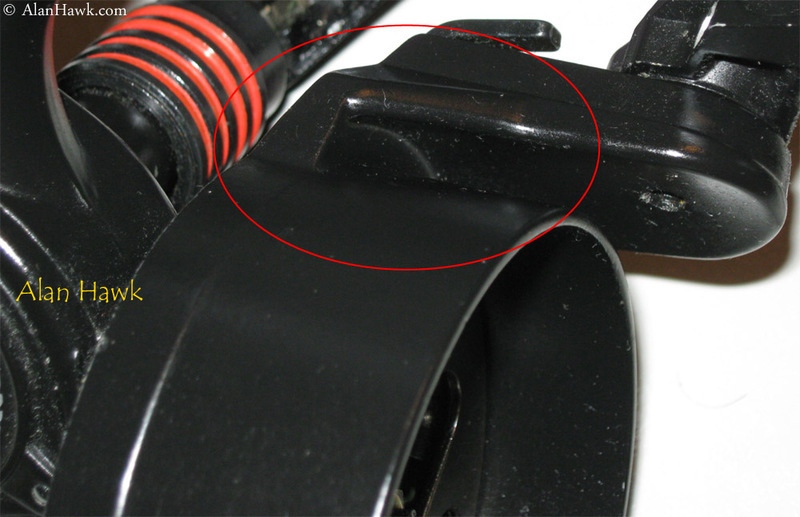 The rubber ring (green arrow) dampens the metal contact sound so that when the anti-reverse is on the clicking sound is extremely quiet. This braking design is of an impressive strength. Big spinners that came years later had brake dogs that were mounted on little posts, making the brake only as strong as the those posts were. 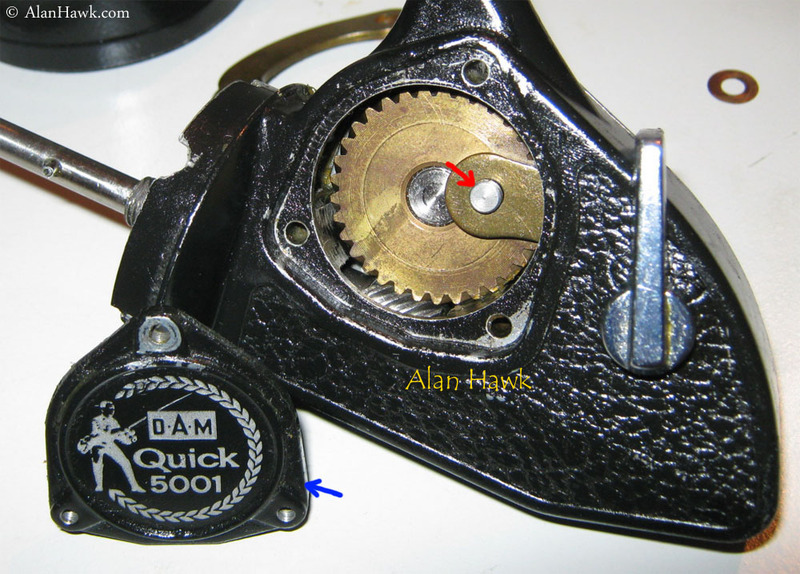 In the Quick 5001 though the stainless steel lever would get wedged between the pinion and the reel's body making it impossible to break and allowing the reel to withstand higher amounts of drag. This anti-reverse is my favourite feature in this reel, considering that 36 years later I am yet to see a mechanical stop that comes close to its strength and reliability. Up till that point DAM had made the worm drive gears of their reels from bronze, and those gears were extremely durable, but for this new generation of reels they wanted something even better, so they went with phosphor-bronze. You can search the internet and read about this material in detail, but in a few words phosphor-bronze is a very strong alloy that has a low coefficient of friction for smoothness, and is considerably more resistant to wear than traditional bronze. Machining this powerful alloy was difficult and slow, but as a friend of mine used to say "nothing is too difficult for a German workman who's good with his hands". 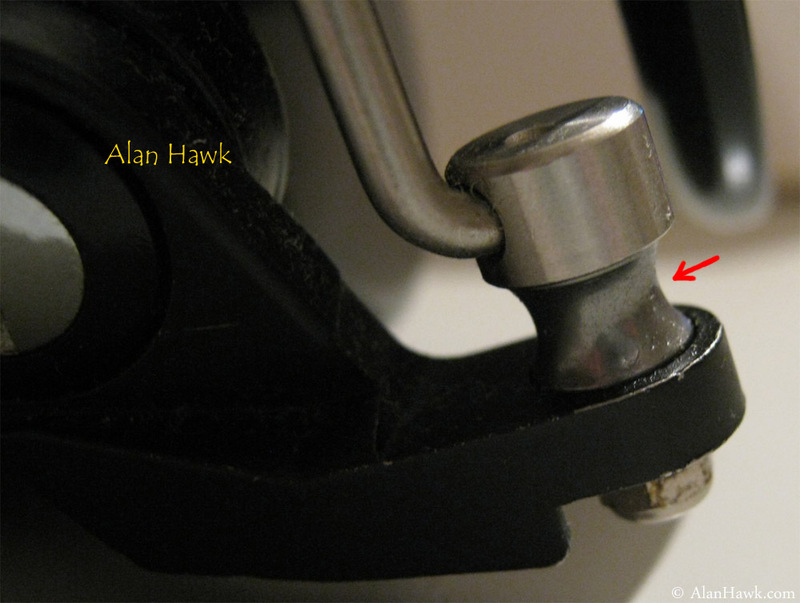 A stainless steel pin was embedded deep into the gear for the oscillation lever (red arrow). The back of the gear and its thick shaft, and you can see that the gear itself is made of two parts pressed together. 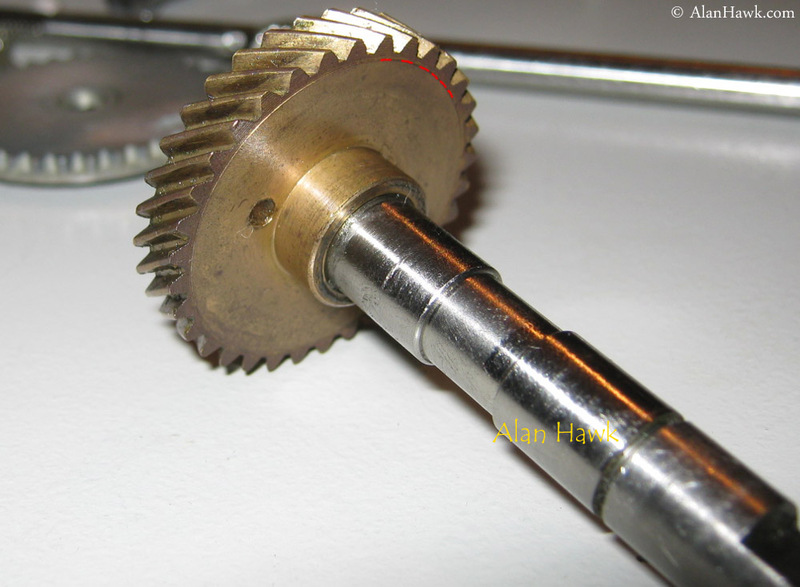 The main body of the gear made from brass, and the very hard phosphor bronze crowning. The red dots mark the seam line between the two. The thickness of the gear is obvious in this photo. One of the biggest advantages of the worm gearing is that the contact area between the drive gear and pinion is much bigger than the contact area between gears in bevel or hypoid systems, and this allows for more force to be applied safely and increases the service life of the setup. 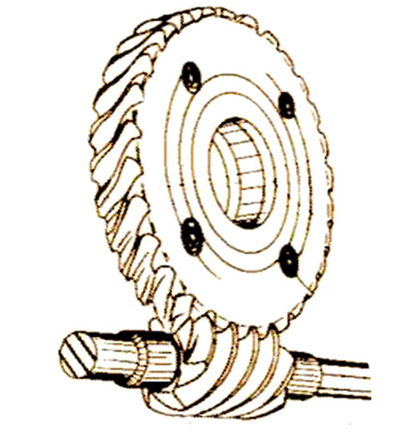 The big disadvantage of worm gearing though is the low efficiency due to the sliding action of the gears. It's the least efficient gearing type used in spinning reels. The pinion is a machined piece of steel. Most people believe that stainless steel is "better" than steel, but that's an oversimplification. Stainless steel is harder, while steel is tougher and less brittle. So for example gun barrels are made from steel and not stainless steel in order to endure the explosive expansion forces and pressure without chattering, while hunting knives have stainless steel blades to retain sharpness for longer, yet again knives made for bushcraft have steel blades for toughness and ability to withstand blows. Different properties for different applications. 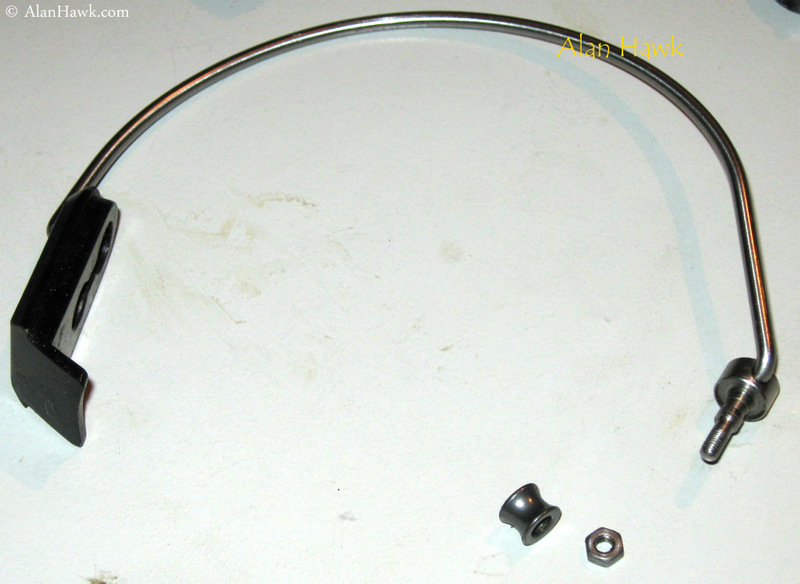 For a saltwater reel stainless steel would appear to be the automatic choice, but DAM had already been using steel pinions for decades successfully and they just didn't want to change a tested and proven part. That choice wouldn't be right today with all the advanced stainless steel alloys we have, but nearly 4 decades ago it seems to have made sense to them. Anyhow, as long as the reel is properly lubricated and isn't submerged during fishing, the pinion should remain corrosion free. My Quick Super was bought by my grandfather in 1959, and 54 years later the gearing is still tight and clean. While the reel had only one ball bearing, they took care of other friction points in a more traditional manner. 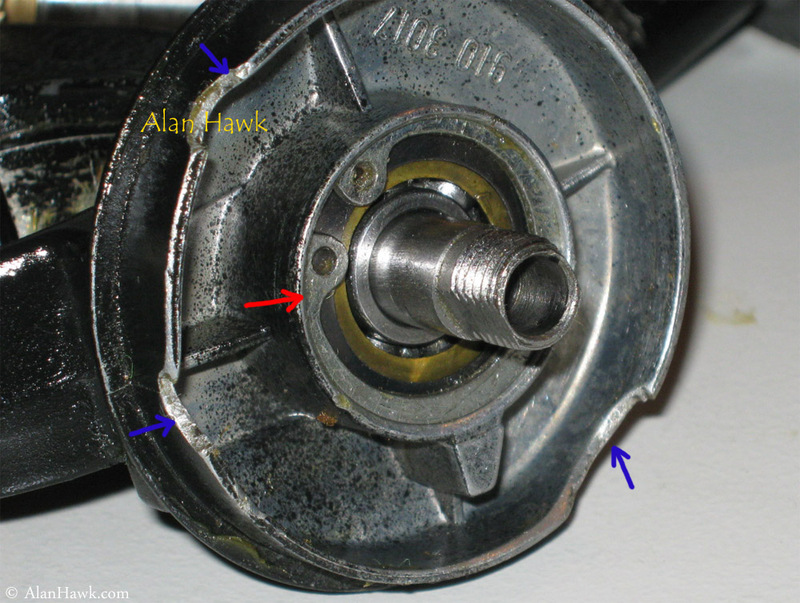 The inner end of the pinion was borne on a sintered bronze bushing (red arrow), and the drive gear shaft was borne on two similar bushings (blue arrow). Sintered bronze is a classic bearing material made by packing the metal powder in a mould then heating it to just below the melting point, which fuses particles together and creates a solid part that has a porous surface. Those surface pores capture lubricant and keep it trapped there so the bearing is virtually self lubricating. It's not as smooth as a ball bearing, but it's maintenance free and I haven't seen one worn out yet. 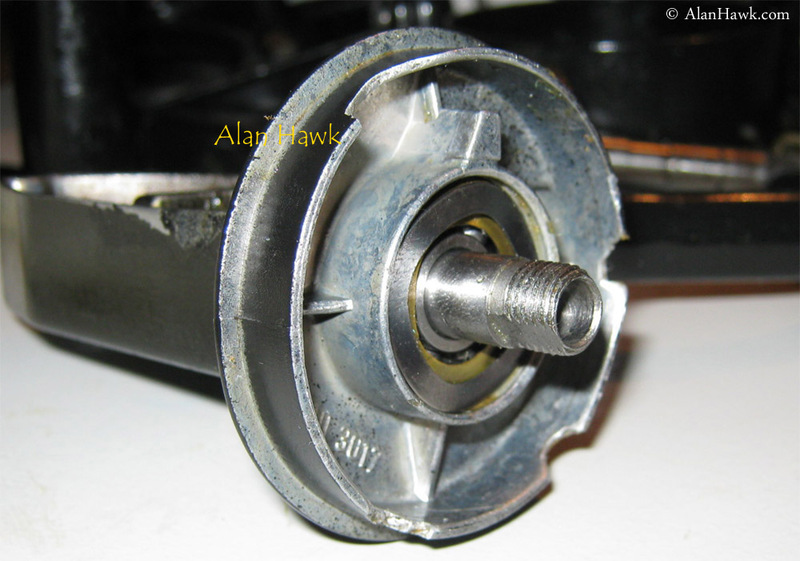 With the screws of the drive gear plate removed, the side cover could be taken off, and the original oscillation lever is replaced with the spare inverted lever (red arrow). 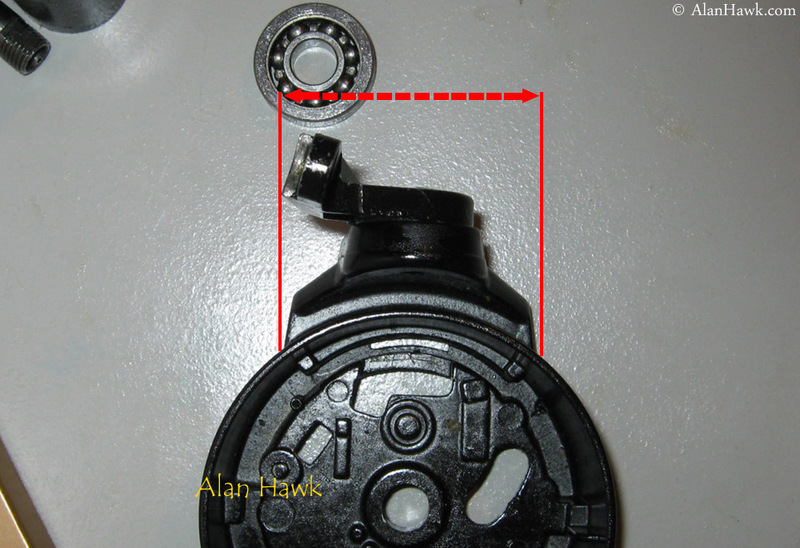 The side cover would then be placed back, and the drive gear plate inserted from the opposite side making sure the stud in the gear goes through the hole in the oscillation lever (red arrow). 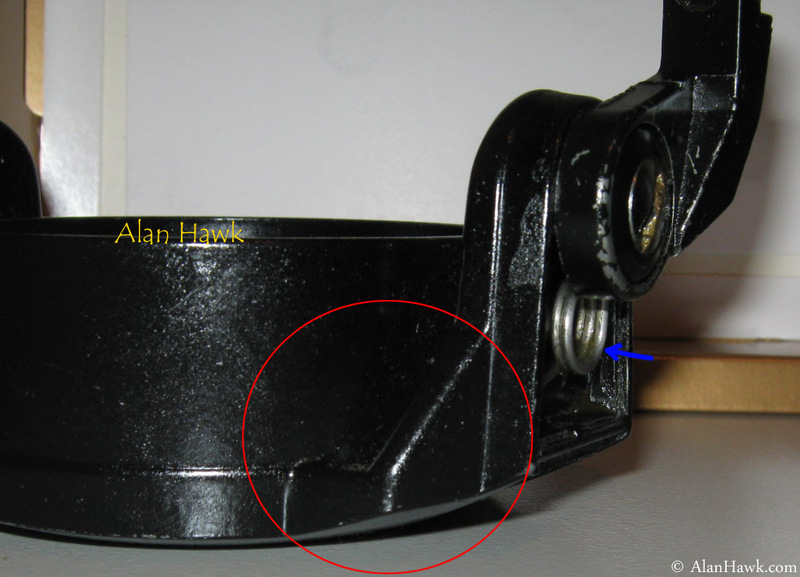 The retaining clip would then be installed to secure the gear and lever together, then the triangular part of the body that was originally on the right side (blue arrow) is inserted in the opening and secured by the three screws. 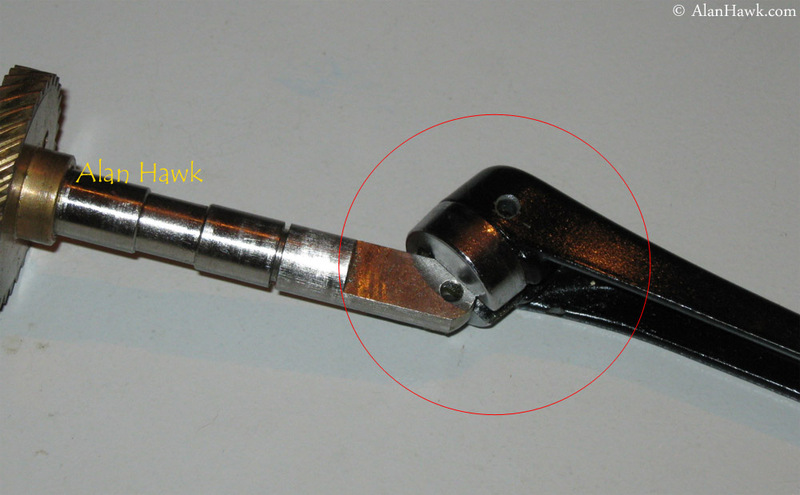 Here is the handle in the collapsed position, held in place by the up pressure from the spring loaded ringed sleeve (red arrow). 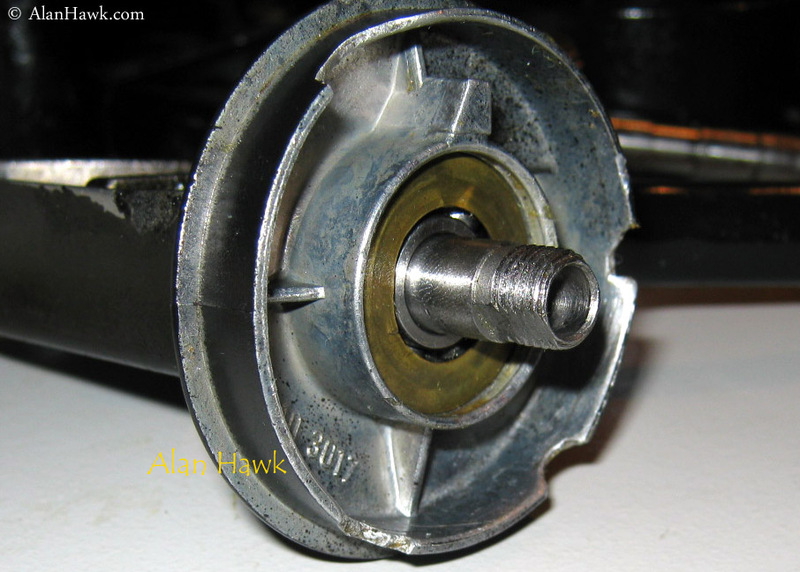 This is a reel from the 1000-5000 series, and as you can see the handle had the old style screw nut to keep it up, and that dated system was problematic because the nut would become loose during fishing and need re-tightening to keep the handle stable. The other major upgrade they made was the dual top and bottom drag shown earlier in this review. As you can see in the photo above the old 1000-5000 series had a traditional top stack drag made up of very small washers. The handle knob assembly is straightforward and simple, and it was also an upgrade from the old series allowing for better gripping. Before we move on a quick note about the handle. The first reels in the 1001-5001 series had handles that were finished in silver (blue arrow), so was the bail trip lever (red arrow), the spring housing cover (green arrow), and the block at the other end of the bail wire (not shown in this photo). On later reels the handle, trip lever, and bail block became black and the text "Quick Snap" was printed in red on the handle, while the spring cover remained silver. Then in the final version of the reel the spring cover went black as well. The body was beautifully streamlined and the metal was textured, but that jumping fish always faded out with regular use and cleaning. When the reel was new the anti-reverse switch (red arrow) would stop a few millimetres from the body in both "on" and "off" positions. In the photo above you can see it stopping well clear off the body. Yet with use the lever would start touching the body, and eventually that would leave marks in the finish where the lever rests in the "off" and "on" positions (red circles). You can also see that the fish on the side cover is nearly gone. The lever was designed to be stopped clear of the body by the edges of the lever mount. 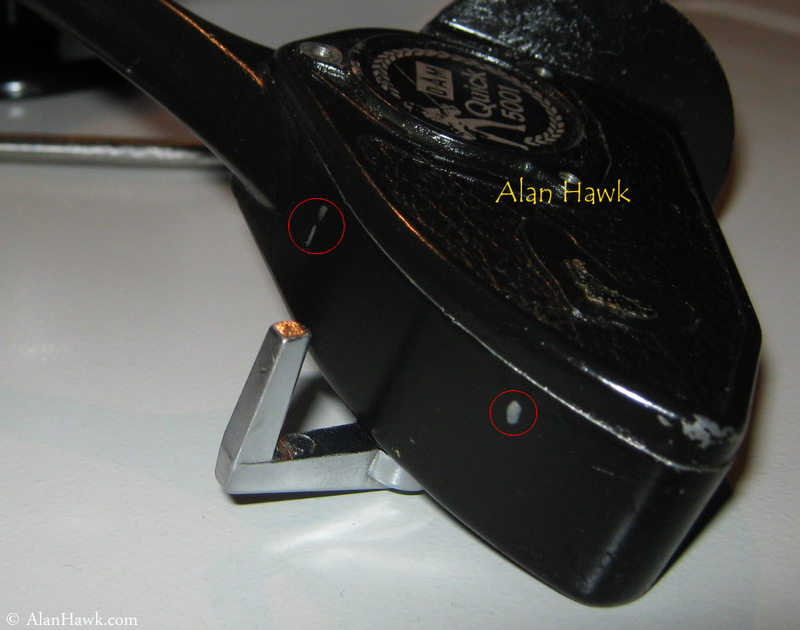 With constant use and the lever being pushed on and off, the edges of the mount would deform (red arrow) allowing the lever to slam against the body and make the marks shown in the previous photo. Doesn't affect the function of the reels, but those marks always annoyed me and that design flaw could have easily been avoided. That immense hardness meant minimal wear thus the roller kept spinning freely and salt residuals couldn't accumulate because of that. I have tens of Mitchell and Abu reels from that period and older, and the rollers on them either don't spin at all or spin roughly when lubed before they stop again. The Tungsten Carbide rollers of my Quick reels always spun freely as the day they were new. Simple construction. Just the roller and no washers or spacers of any kind. That hard roller makes the reel safe to use with braid today. That line roller was mounted on a bail arm that's similarly impressive (red arrow). It was a massive block of metal of a thickness that was unmatched by any other reel that existed then. The dead reel is on the left next to the one that I still fish. 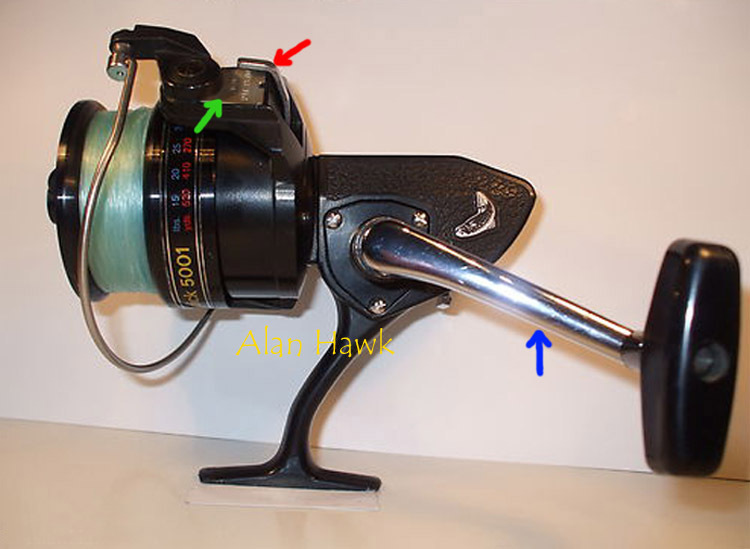 The bodies of both reels are horizontal but obviously the stem of the dead reel looks funny. It was 11 years ago, was on a shark fishing trip and we were catching and releasing nice blues up to 60kg. I then hooked one that was definitely larger than that and fought it for 10 minutes, upping the drag periodically as it kept taking more line than I was retrieving. He finally came up and the fight was nearing the end when he swam right under the boat, and as I upped the drag once more to try and stop it, the line rubbed on the boat underwater and broke. I then saw that the stem of the reel was bent forward, and as it then mounted funny on the rod the reel became unusable. I did not touch the drag knob that week until I went home and measured the drag and it was exactly 20.1kg (44.4lb) according to my notes. Later on I determined the safe maximum drag of 18kg using this and a couple of other Quick 5001 reels. This review has been in the making for quite a few years and it's of a reel that I love very much and have a special appreciation for. I have always been a dedicated saltwater fisherman who enjoyed catching big fish, and despite hating conventional reels intensely I was forced to use them whenever I went chunking for tuna, trolling, or dropping live bait to groupers. Growing up I kept buying any big spinner that comes out hoping it could be adapted to that sort of heavy fishing, but there would always be a weak link either in the drag, handle, anti-reverse, or gears, and during my search I bent quite a few bail arms and broke more than a handful of gear trains. Then I found the Quick 5001 and could finally put down the conventionals. It was a true game changer that came with a new design philosophy based on a combination of brute strength and features well suited to handling fish of unprecedented size for a spinning reel. Several of those design aspects carried on to become an integral part of today's big game spinners, and others remain unmatched by any reel to this day such as the strength of the anti-reverse or the longevity of the gearing. When this series of reels came out it was the culmination of nearly 100 years of excellence in making fishing tackle by DAM. No better saltwater spinning reel was built by the company until the end, and overall it was the third to last series they built, followed only by the 1984 Finessa XL 125-445 and the 1994 Royal MDS, both of which were families of small freshwater reels. There was once a time when tackle companies had two clear targets: Build them to last so buyers would come, and keep them affordable to outsell the competition. That was what DAM, Mitchell, Abu, and many other companies were doing. Unfortunately the collapse of those old world bastions gave way to today's carnivorous strategy: Planned obsolescence. No mainstream company is going to give you a reel that lasts for ten years for $100, $200, or $300. That would be bad for business, and the cast alloys and plastics and low grade components are there to make sure of that. Now you need to pay north of $600 to get something that lasts anywhere near the beautiful machines of the past that are still serving us 40 or 50 years later which cost a fraction of that, even when adjusted for inflation. Quality parts don't cost as much as companies want you to believe, I know that first hand from the factories that build their reels. This is just the way the world works today, and since all of them are doing it we have to accept it as the new reality. I might not agree with the Rolls Royce analogy, but I definitely agree with the bottom line "It's what's inside that counts". Hope you've enjoyed this and hopefully I'll be reviewing more classic reels when I have time.